5 bedroom, 3 bath townhouse at Crawford Hills. The development is very spread out with lots of trees and privacy. Each unit has a private driveway. Depending on the time of year (and how much snow), the driveway will hold 3-6 cars. It's 1 mile from Attitash ski area, within 1 hour's drive to Bretton Woods, Cannon, Black, Wildcat, Cranmore, & Sunday River. Summer attactions within 1 hour include Attitash (alpine slide & water slides), Storyland, The Flume, Mt. Washington, Clark's Trading Post, Loon Mountain, Santa's Village, Saco River (swimming, kyaking & canoeing), horsebackriding, hiking, biking, etc... 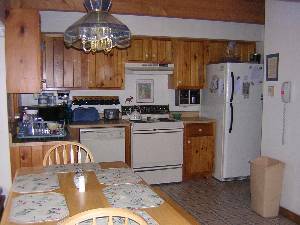 The townhouse is fully equipped with a microwave, dishwasher, washer/dryer, blender, toaster, mixer, coffee maker, gas grill, iron & ironing board, telephone, stereo, CD player, DVD player, and VCR. Many new updates in the past 3 years: wall-to-wall carpet in basement & on main floor, paint in many rooms, 2 TVs, Refrigerator, Dishwasher, Kitchen/Bathroom floor, Comforter Sets in Bedrooms, Kitchen Table, Roof, etc. The unit has 2 living rooms, each with a woodstove and color cable TV, which gives a private area for adults and children. Nicely furnished, plenty of room. It's well-suited for groups and multi-families. There is a large wraparound deck off the main floor which is perfect for that nice day to enjoy a barbeque and a blender drink. Both gas grill and blender provided! Main Floor - combination living room/kitchen, bathroom, mudroom, large wraparound deck, 1 bedroom with full size softsided waterbed. 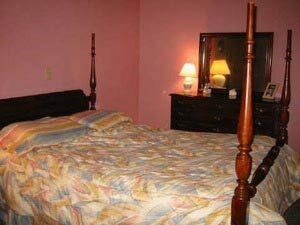 Second Floor - 2 bedrooms with 2 twin beds each, 1 bedroom with a king size bed, bathroom. Basement - Large living room, 1 bedroom with a king size bed, bathroom, laundry room. The basement living room has sectional & a couch, and the main living room has a couch & loveseat. Has new TV, sofa/loveseat, and carpet. New Dishwasher, floor, and fridge. The 5br. place at Crawford Hills is great. 9 of us headed up there for a 3 day weekend recently. There was ample room, yet it was still cozy and the yard is great for snowball fights. I've rented from her for 3 years in a row and Ginny is really stragiht forward and easy to deal with. Nice townhouse, with lots of sleeping room. Convenient location to Attitash Mountain. Spacious, finished basement with another living room and additional bedroom. Had lots of fun! The townhouse is very cozy and welcoming. 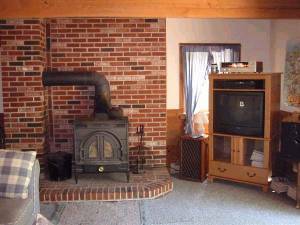 We spent most of our time in the lower level where there is enough room for everyone to sit and relax by the wood burning stove. 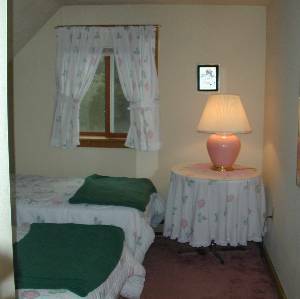 It is a short drive to North Conway Village and five minutes to Attitash Mountain. I would highly recommend this townhouse for your next group getaway! We come home saying the same thing every year after staying at Ginny's townhouse. We wish we could stay for more than one week a year. But time doesn't permit. Ginny's townhouse is ideal for a large family like mine or a sizeable group. What impresses me the most is that every year as soon as we arrive you can see that she's done something to improve the place even more. It's spacious, with 3 full baths and a well equipped kitchen. It's location is close to many points of interest as well. We recommend staying here to anyone who wants the comforts of home (with the savings too) in a relaxed atmosphere in the mountains. We wouldn't consider staying anyplace else. Thanks again for a wonderful time. Lovely home. I had a crew of 11 people up at the house and we were more than comfortable with all of the space. Working with Ginny was a pleasure. I am always apprehensive about anything conducted over the internet, but she was always quick to respond to all of my questions and everything was exactly as advertised. Great house, wonderful development, fantastic location. These is much to do in the White Mountains, and Ginny's house made for a perfect home base. Plenty of room for the nine of us, and we looked forward to making use of the pool at the end of each day of sight-seeing, shopping, and activities. Hope to do it again soon. We rented this house for a week from June 22-29 2003. We just love this location. 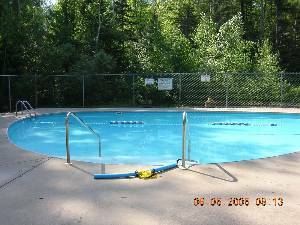 Crawford Hills is a great complex, clean, private, peaceful, nice pool and convenient location. This house is very comfortable with plenty of room and has everything you need. We just loved it and look forward to returning. My 10 year old says "the house was great and I had alot of fun!!!" Our troop of Cadette Girl Scouts have used this condo for the past two years, and absolutely love it! It supports our need of being all together in one place, without the worry of being out in the public. The condo is wonderfully maintained with everything we used in working order. The location is fantastic. Set in a wooded area, it is quiet and peaceful. Away from the bustle & congestion of being in town. But close enough to all the attractions and restaurants. We loved it and can't wait to return. BIG kudos to the owner for trusting in us and affording us the opportunity to come to the White Mountains. Many wonderful memories were made for these Girl Scouts. Thank you! I had a great time at this location on June 13th. I invited my family up for the weekend, the price was excellent, the house was extremely clean and well stocked. I found the directions and facilities to be excellent. The pool was heated and we spent a lot of time swimming and having fun. 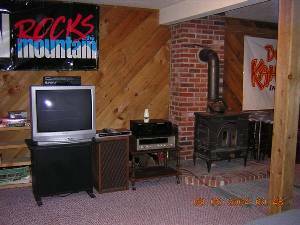 The unit was very well stocked, there were lots of games, a couple of tvs, vcr, nice comfortable couches, great sitting area for meals. There was 2 living rooms, one upstairs where the adults sat and talked, and one downstairs where the kids could watch tv, play games and have a great time (and not bother us too much). I loved the gas grill out on the deck, we had a couple of BBQ's and the kids toasted marshmellow. The location is excellent for all seasons. We were a short distance from Attatash, quick drive for dozens of resturants, and 10 minutes away from the outlet shopping. I ski out of North Conway and hope to be able to rent the unit for a number of weekends this season. The unit had everything I was looking for, and more!! I would strongly suggest you give this location a try, you will be very happy. We are homing to make the trip up an annual family event!!! I have rented this townhouse on several occasions, each time was great! 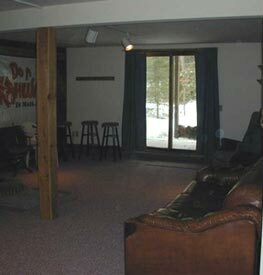 The condo has everything you need and not far from Attitash. It is a pleasure to rent from Ginny. of us went up with no kids for the weekend, 'what a treat! I have been a little slow getting the key back to you because of some construction we are having done to our house. However, it should be in the mail tomorrow(Friday) morning. Thanks again we had a great time at a great house. We had a wonderful time, and you have a lovely home. Letter received when key was returned from 2 families that rented a week in July, 2002: ________________________________________________________ We had wonderful weather and a great time while we were there. The layout of the condo was perfect for our group, and we had plenty of space. For the past 4 years we have stayed at Ginny's townhouse in Bartlet. We used to stay in Lincoln but we out grew the place we stayed there. We have been coming to New Hampshire for a week for the past 18 years. Staying at Ginny's is actually better than being at home. Five bedrooms and 3 full baths provides ample room for me, my wife, my 5 children ages 8-22, and my sister in law. The full sized kitchen, which is fully equipped with dishes, pans etc. allows us to save money by making several meals at the townhouse rather than always eating out. North Conway has a Shop and Save and Sper Shaws with reasonable prices like home. The townhouse is spotless and is constantly improved from year to year. The pool is never crowded. It's within a few minutes of North Conway, Attitash, and many other major attractions. It is also just a mile from Bear Notch Road which brings you down 10 miles onto the Kankamangus Highway heading west and just 2 miles the other way allows you access to to West Side Road, a convenient bypass to the hectic traffic on late afternoons in North Conway. As long as Ginny will have us, we'll return to stay. We have been going to Ginny`s townhouse for many years and we enjoy it more every year we return. ---------------------------------------------------------We've been going to No. Conway/Attitash area for the past three years and have always rented hotels. This was a first for us and we thoroughly enjoyed having a townhouse that was so roomy. With three boys, ages 11 to 16 with us, everyone was happy because we all had our own space. The townhouse has everything needed for a great vacation including the location. We would highly recommend renting this townhouse to anyone who asks. Rate varies depending on time of year and length of rental. Renting for weeks, weekends, etc. Vacation weeks can only be rented for the full week. Holiday weekends must be rented for the 3 days. Other than that, I'm pretty flexible in terms of rental timeframes. Weekly rentals run from Sunday PM - Sunday AM. Deposit: 1/2 down, 1/2 due 3 weeks before you head up. Also require a security deposit of $200 at the 2nd payment. This will be sent back to you once the house has been cleaned and checked out. Cancellations and Refunds: Full refund as long as I can rent the timeframe you had originally rented.